Does your loved one yearn for a VW Camper? Want to surprise them with a Campervan holiday? How about buying them Campervan Hire Gift Vouchers! So many people wish they had their own VW Campervan. But if you haven’t got a spare £50k to splash out, how about choosing campervan hire gift vouchers instead? We are happy to offer gift vouchers to fit your price. They don’t have expire dates, so there is no rush to spend them. You can add multiple campervan gift vouchers together so family members can club together to get that special someone the holiday of their dreams! Chosen your dates and just want to place a deposit? No problem, we can make up a presentation voucher for you and process the booking with you as standard. Check out our prices and availability. 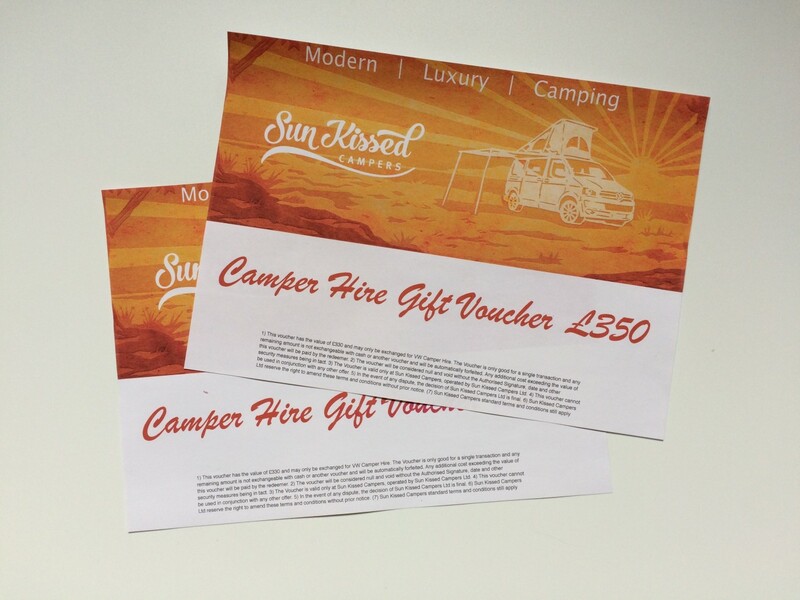 Please email info@sunkissedcampers.co.uk to order your vouchers or discuss your requirements. Campervan gift vouchers have to be posted or collected. We cannot email electric copies.